Dr Bill Brooks has been studying families with inherited forms of Alzheimer’s disease and similar conditions including familial frontotemporal dementia for over 25 years. He is currently working on the international DIAN study (Dominantly Inherited Alzheimer Network). Friday, November 7, 2014 was an important day. That day, Amanda Ayliffe, our first participant, received her first dose in the DIAN-TU-001 study, an international clinical trial aimed at preventing Alzheimer’s disease. Amanda and her husband David with Dr Brooks and the trial team. Most people with Alzheimer’s disease have no apparent cause for their condition, but some families have an inherited form of Alzheimer’s in which a genetic mutation can be identified as the cause. People who inherit the disease-causing form of the gene usually develop symptoms in middle age, between their thirties and fifties, whereas their brothers and sisters who inherit the normal form of the gene remain unaffected. These families are rare, but because they have a known cause for their disease they are of crucial importance to our understanding of Alzheimer’s disease in general. Australian families have been participating in this important research in Sydney since 1988, before the first Alzheimer’s gene was discovered. We now know of more than 20 families in Australia in which a genetic mutation has been identified. Family members are spread throughout the country, and over the years Bill has seen a fair bit of Australia and even New Zealand, travelling from far north Queensland to Tasmania and from the east coast of New Zealand to the shores of the Indian Ocean in Western Australia. One problem with studying a condition involving a relatively small number of people spread over a wide area is the difficulty of obtaining standardised scans and assessments. Some progress towards solving this issue came in 2009 when NeuRA was one of four international sites (Sydney, Melbourne, Perth, and London) invited to join the Dominantly Inherited Alzheimer Network (DIAN Study). DIAN was funded by the US National Institutes of Health to develop biomarkers of disease activity in familial Alzheimer’s disease. 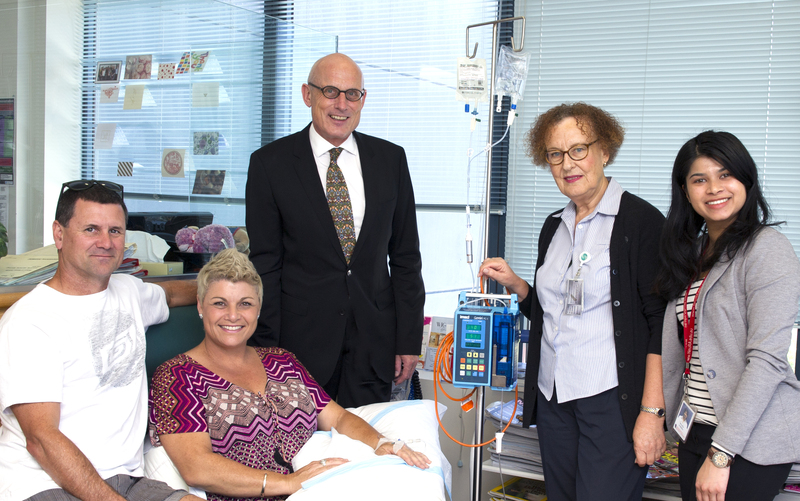 This funding included an amount to pay for participants to travel to the three Australian study sites for MRI and PET scans, clinical and cognitive assessments, research blood collection and lumbar puncture for spinal fluid (CSF) biomarkers. 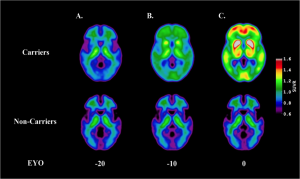 Results from DIAN showed that deposition of amyloid protein in the brain (a consequence of mutation in the genes related to familial Alzheimer’s disease) can be detected by PET scan 15-20 years before symptoms develop. In addition, about 5-10 years before symptoms start, the cerebrospinal fluid levels of tau protein, another protein associated with Alzheimer’s disease, start to increase. These early markers of disease activity provide a window of opportunity to intervene in the Alzheimer’s disease process to prevent neurodegeneration and hence stave off symptoms of memory loss. Eligible DIAN participants, including some who have had testing and know they are carrying the disease-causing form of the gene and others who have not had testing but who have a parent with the gene, have now begun enrolling in DIAN-TU-001, a related but different clinical trial in which they are randomized to receive one of two monoclonal antibodies targeting amyloid beta in the brain, or to receive a placebo. The trial will last for two years and 210 people will be enrolled through 27 sites worldwide. The trial sponsor is Washington University in St Louis, Missouri; the Chief Investigator is Dr Randall Bateman. The Site Principal Investigator at NeuRA is Dr Bill Brooks and the Study Coordinator is Mirelle D’Mello. The DIAN observational study is supported by the US National Institute on Aging (NIA) of the National Institutes of Health (NIH, UF01 AG032438), the German Center for Neurodegenerative Diseases (DZNE, German sites only), an anonymous foundation and from the philanthropy of F Simmons and O Mohan. At NeuRA we have also received funding from the JO & JR Wicking Trust and the Mason Foundation. The DIAN-TU is supported by the DIAN-TU Pharma Consortium (Biogen Idec, Eisai, Elan, Forum Radiopharmaceuticals, Genentech, Roche, Janssen, Eli Lilly and Co., Mithridion, Novartis, Pfizer, Hoffmann-La Roche and Sanofi), the Alzheimer’s Association, GHR and anonymous funders. The DIAN-TU-001 trial is supported by the US NIA (R01 AG046179 and U01 AG042791), the Alzheimer’s Association, Eli Lilly and Co., Hoffmann-La Roche, Avid Radiopharmaceuticals, and CogState. You can read more on the NeuRA website, the NIA website, www.dian-tu.org and www.dian-info.org. Footnote: In one arm of the study, the monoclonal antibody or placebo is given by intravenous infusion, as shown in the photograph. In the other arm, the monoclonal antibody or placebo is given by subcutaneous injection.